Learn strategies to embrace personal transformation. Big Cat Chronicle is the personal blog of Kathy Herrmann and it combines valuable insights punctuated by her wit. I may never completely rid myself of my allergies to tree and grass pollen, dust and mold but, starting in December, I made a commitment to find ways to lessen their affects on my body. The reason? Between my watering eyes, constantly runny nose and incredible itchiness from allergy-related eczema, I couldn’t stand it anymore. I’ve been doing a lot of different things since early December and one delicious change is substituting raw honey for refined sugars. Aside from honey being a healthy substitute for refined sugar, it in combination with the healthy saturated fats I’m now eating, is also having the delightful effect of helping to cut my cravings for junk food. I’ll talk about cutting my junk food cravings in another article but it’s pretty amazing. My mom considered me her problem eater growing up because I was so picky about what foods I’d eat (and still am). I’m a life-long junk food junkie. And over the last few years, I became a huge drinker of diet sodas (Diet Dr. Pepper is my favorite). Thus, you can say my diet was full of refined sugars and bad fats. To combat my allergies, I decided I needed to work on strengthening my immune system by dramatically improving my diet. One of my small but hugely significant changes is introducing raw honey into my diet as a commonly consumed food in place of refined sugars. Raw honey is a super food that provides antioxidants, 27 minerals, vitamins, 22 amino acids, 5,000 enzymes, carbohydrates, and phytonutrients. And it’s also a anti-bacterial, anti-viral, anti-fungal substance. In contrast, refined sugar is empty calories with none of the nutritional value of raw honey. Not only that but refined sugar is sucrose which is made of two molecules bonded together. When you eat sucrose, your body needs to use your own nutrients to metabolize it into fructose and glucose. Thanks to bees, though, raw honey is already broken down into fructose and glucose (and the latter is literally brain food). I’ve always loved honey (and sourwood is my absolute favorite). What sold me on becoming a honey aficionado once again, though, is the potential to fight against tree and grass allergies. Raw honey is straight from the hive and is unprocessed so it can contain bits of pollen, honeycomb, and propolis (a.k.a., the sealant bees use for unwanted open spaces in the hive). Some beekeepers will strain the honey to remove some of the bits. As for me, I don’t want trigs in my honey but do want the comb. Because raw honey has never been heated above the temperature of the beehive, it’s almost always in a (semi-) solid or crystallized form and tends to be milky white to light caramel in color. I couldn't find a picture of the 365 Raw Honey I bought but here's a picture of a jar of raw honey from Amazon so you can see what it looks like. In contrast, most commercial honey is processed, which means it’s been pasteurized and filtered so that it looks good on the supermarket shelf. It’s liquid and has that goldeny color to it. The pretty look comes at the cost of killing off the live enzymes and yeast though. What this means is the commercial honey is a big step down from raw. Since much (most?) of the nutritional value is lost by heating, to me it seems like commercial honey is little better than table sugar. Also, don’t be fooled into thinking that creamy honey is the same as raw honey. Creamy honey is pasteurized but via a method that allows the formation of larger crystals that can occur in raw honey. Thus, if you want the full health benefits, stick with raw honey. I tried to find raw honey at my local Giant food store but had no luck. As expected, though, Whole Foods carried it and they have a number of different brands. Raw honey is definitely more expensive than table sugar. However, since I’m buying much less in the way of sodas and junk food, I think the cost will be even out. I’m also looking into finding local sources. Local honey is produced by bees in your immediate or near-by environment so this honey can be more stimulating to your immune system, helping you better adapt to your environment. Finding ways to add honey into my diet is easy. I don’t do a lot of baking so most of my honey consumption is in drinks or for breakfast. I keep my consumption to no more than about 6-7 spoonfuls (which is about 2 tbsp) a day so I don't have all of these drinks or foods everyday. Additionally, I'm watching my sugar conception in other processed foods to keep my total sugar consumption reasonable. Since mid-December, I start my morning with a glass of warm lemon or lime water spiked with honey (or sometimes I do a lemo-lime combo). I use a whole lemon or lime and a spoonful of raw honey. The combination is quite tart because I use a modest amount of honey so I chug it down quickly but it’s an excellent pick-me-upper. Since I’ve been drinking it, I don’t need caffeine in the morning. Lemons and limes are chockful of Vitamin C (a great source of antihistamines) and both are useful in cleansing the body of waste. 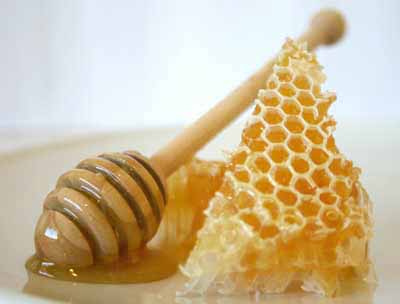 Honey is a natural and more stabilizing source of energy and is also beneficial for digestion. 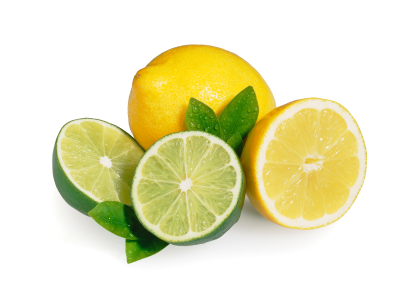 Lemons and limes are also both alkalizing foods. Yeah, that's counter intuitive because both fruits are acidic on the outside of your body. However, the way your body metabolizes them on the inside makes them alkalizing and that also aids digestion. Since good digestion can help keep the immune system strong (and thus help your body fight allergies), this combo is a big plus for me. 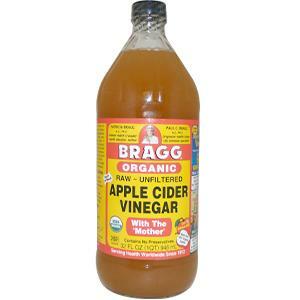 1 –2 Tbsp raw apple cider vinegar. Spoonful (give or take) of ginger crystals (found at Whole Foods in the tea isle). Cinnamon to taste (or not). I’ll talk more about apple cider vinegar in another article. For now, though, raw AVC is cloudy (thanks to the retention of the nutricious good stuff). Bragg is the big Kahuna of AVC but I bought 365 at Whole Foods. I'm trying to eat at least one serving of plain yogurt every day since it's chockful of good bacteria and I either eat it for breakfast or as a dinner dessert. Sometimes I add a little honey to jazz it up. I buy Dannon Plain Yogurt in the bigger tub rather than individual servings because it’s more economical and eco-friendly. Dannon Plain Yogurt is a good choice because it doesn't contain sugar. Another occasional breakfast favorite is toast with honey. I often use coconut oil instead of butter. Oatmeal is often my main carbohydrate for breakfast if I forego toast. I use the real oats, not instant, and make it either with milk or water and then occasionally use honey for a bit of sweetening. I enjoy black tea in the winter so I’ve been having a cup or two of decaf during the day or early evening. Some of the teas I especially like are Bigelow’s Constant Comment, French Vanilla, and Chai (black tea). Constant Comment I drink straight but the other two I add some coconut milk and sometimes honey (less than spoonful). I know that green tea is the cool thing now a days but I don’t like it. My compromise is decaf black tea. I’ve been suffering from insomnia for several years (and I’ve no doubt it’s a combination of age and too much caffeine). To help combat this, I started drinking a honey nightcap about an hour before bedtime. I’ve tried eating a spoonful of honey straight up but it tasted way too sweet. Now I add a generous spoonful to either warm water, decaf tea, or warm milk (coconut or cow). Coconut milk and honey is my favorite. [We burn an] amazing 70% fat during rest, 35% during low level exercise, 20% during moderate exercise, and a low 10% during intense exercise. During sleep we should burn fats. However, if the liver is not fuelled prior to bed, we release stress hormones from the adrenal glands which raise our heart rate and blood pressure. These hormones instead of burning fat, degrade muscle and bone. The liver must deliver 10 grams of glucose every hour -- 6.5 to the brain, 3.5 to the kidneys and red blood cells. As the liver capacity is only 75 grams, most people go to bed with a depleted liver, activating the adrenal glands and do not recover. And if you do not recover you do not burn fats. What caught my eye on the Benefits of Honey website is the symptoms of an unfueled liver. The list sure fit me. Since I’ve been having my honey nightcap, I find I’m sleeping much better at night. I still am waking up on some nights. However, on those nights it’s usually only one time instead of several and for just a minute or two before I drop back to sleep (and this in spite of drinking fluids throughout the evening and close to bedtime). If I lose weight in the process too, then yahoo. I’m just glad to be sleeping better and waking up more refreshed in the morning than before I started that honey nightcap. I’m not at what I would call a high level of refreshment, yet, but that may be because of OTC antihistamines I’m taking at night to help my allergies. I think if I can get to the point of getting sufficient natural antihistamines in my foods and can then stop the OTC varieties, then I will get the point of waking refreshed. I started to use honey as part of a facial cleansing experiment but I’ll wait for a future article to talk about that. Otherwise, I’m just at the beginning of my journey with honey. On my list, though, is experimenting with milk and honey baths. And I plan to substitute honey for sugar if I do start doing more baking. Do you have honey stories? I’d love to hear from others how raw honey is changing your eating habits and how you’re using it.